Wine Riot II is coming to Boston this weekend, September 25th & 26th, 2009. This time, the venue shifts to the John J. Moakley Courthouse on the waterfront. Here's a list of the wines that will be poured. Looking through the list, I see an eclectic mix of wines I've not tried but would like to. Travessia's Semi-Sweet Vidal Blanc is one of the best wines I've had this year. If you like German Riesling with a touch of sweetness, give this one a try. Speaking of German Rieslings, Dr. Loosen's Kabinett "Blue Slate" Riesling is one I'd recommend. I've always enjoyed the red wines from Stuhlmuller Vineyards. The Buena Vista Carernos Pinot Noir is a great example of California Pinot Noir that won't break the bank. It was featured in The Hunt for $20 Pinot Noir as well as a recent Twitter Taste Live event. Don't be afraid that the event is going to be too wild (it's not really a riot, though it is a good time). There's some seriously smart and cool people who can help you make the most of your time at the event. Arrive with a full stomach. Although Wine Riot does a much better job providing food than other events, it's easy to get excited about the wines and forget to eat. Spit as many of the wines as you can bear. You'll get tipsy even if you spit everything, so take this opportunity to make note of the wines you like as you try news things. Spend time talking to wine makers. If you find a booth that's manned by someone who actually made the wine, talk their ear off and listen to their answers. Turn what would be just a regular tasting into a mini-visit to the winery. Bring your own stemware. It may seem like the ultimate wine-geek maneuver but I've found that tastings like this frequently have either plastic stemless glasses (that are still off-gassing until you've tasted through a half dozen wines) -or- stemmed glassware that's too small. Bring a nice glass from home so you can get your sniffer in there and assess wines the way you're used to. Take public transportation, catch a cab, or assign a designated driver. Drunk driving isn't cool. Nor is driving tipsy. Plan ahead and avoid making a judgment call at the end of the event so you can enjoy yourself. If you don't like crowds, attend the Friday night VIP Riot. I attended the VIP Riot time slot last year and thought it was great. 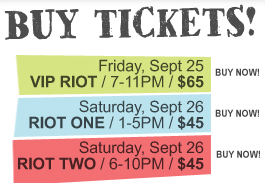 They sell half as many tickets for the VIP Riot as they do for Saturday night's "Riot Two". April's VIP Riot was festively attended, but there's still enough room that you could get around without waiting too long for a pour. Question of the Day: Any other tips for enjoying the event? Are you planning on attending Wine Riot II?